In part 1 I outlined my goal to build an electric standing desk, along with my initial experiment with controlling a linear actuator. Next up was designing the desk. In designing the desk, I decided early on that I wanted to use the surface of the desk I already have – an L-shaped desk from Ikea. The challenge then became designing the elevating legs that will lift the desk, but keep it stable at the same time. The design below is what I’m going to start with. I also thought about using scissor lifts, but decided to give this a try first. These drawings were created with SketchUp. The outside legs will be connected with 24″ drawer slides. The actuator will push down (rather than up) in order to keep the wires from having to extend down to the foot of the desk. Will it be stable enough? Will it be too heavy? 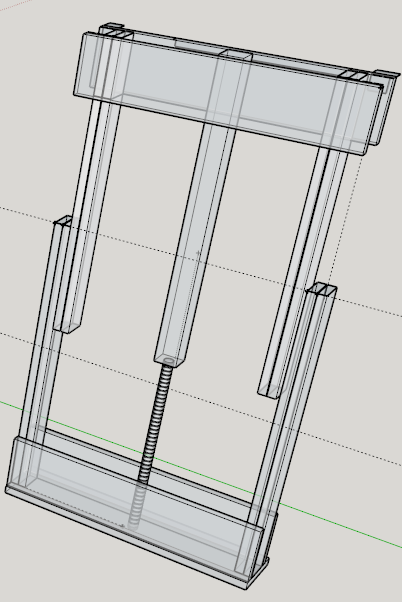 Each actuator can lift up to 150lbs, so with 3 actuators it should be plenty strong… but there’s a lot of wood on there. Where do I need to watch out for little fingers getting pinched, and how can I protect against that? Next up: building the first leg and seeing how it works!